We offer a wide variety of LED signs, Panels, Curtain and Mesh for your application. We guarantee that our products will satisfy your expectations and specific requirements. In case you do not find the product you require, let us know your desired width, length and any other size and technical specifications and we will supply a customised product suitable for your specific needs. 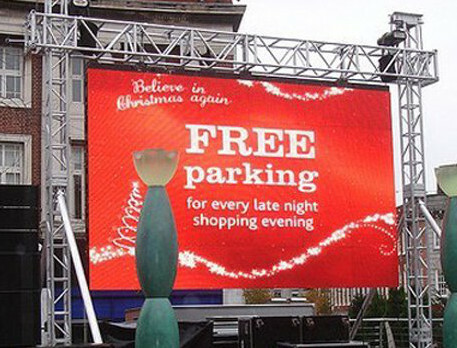 We are able to make any particular type of LED textual or visual solution (Signs, Panels, Curtains, Mesh, etc.) that our Customers require. All the bespoke products supplied by us are made from the highest quality materials and are resistant to harsh weather conditions (IP65 rated). They are also highly vandal-proof and resistant to kicking, stone throwing etc. Due to the wide array of our LED display products we strongly advise you to contact us by phone, mail or use our enquiry form to specify the technical details, software type, size and all other parameters that you would like to be included in your order. You can also see our brochure with complete specifications and possible range of modifications we can apply to give you what you expect.